One in Four Local Banks Has Vanished since 2008. Here’s What’s Causing the Decline and Why We Should Treat It as a National Crisis. 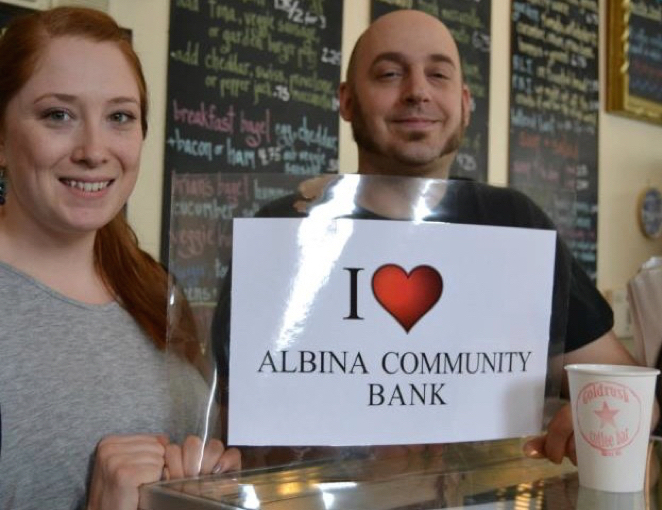 Here’s a statistic that ought to alarm anyone interested in rebuilding local economies and redirecting the flow of capital away from Wall Street and toward more productive ends: Over the last seven years, one of every four community banks has disappeared. 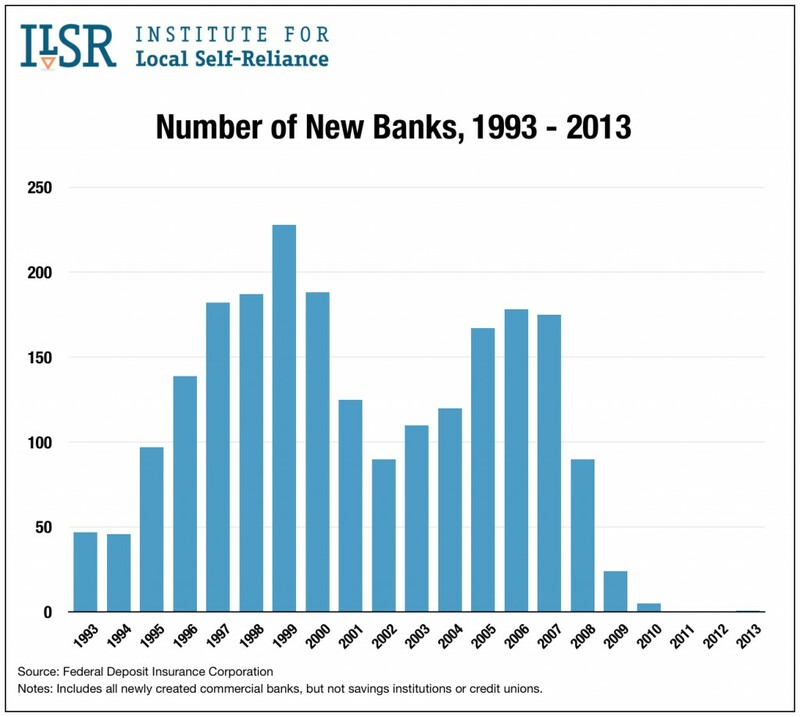 We have 1,971 fewer of these small, local financial institutions today than at the beginning of 2008. Some 500 failed outright, with the Federal Deposit Insurance Corporation (FDIC) stepping in to pay their depositors. Most of the rest were acquired and absorbed into bigger banks. To illustrate this disturbing trend and highlight a few of the reasons we should treat it as a national crisis, we’ve published a trove of new graphs. These provide a startling look at the pace of change and its implications. In 1995, megabanks — giant banks with more than $100 billion in assets (in 2010 dollars) — controlled 17 percent of all banking assets. By 2005, their share had reached 41 percent. Today, it is a staggering 59 percent. 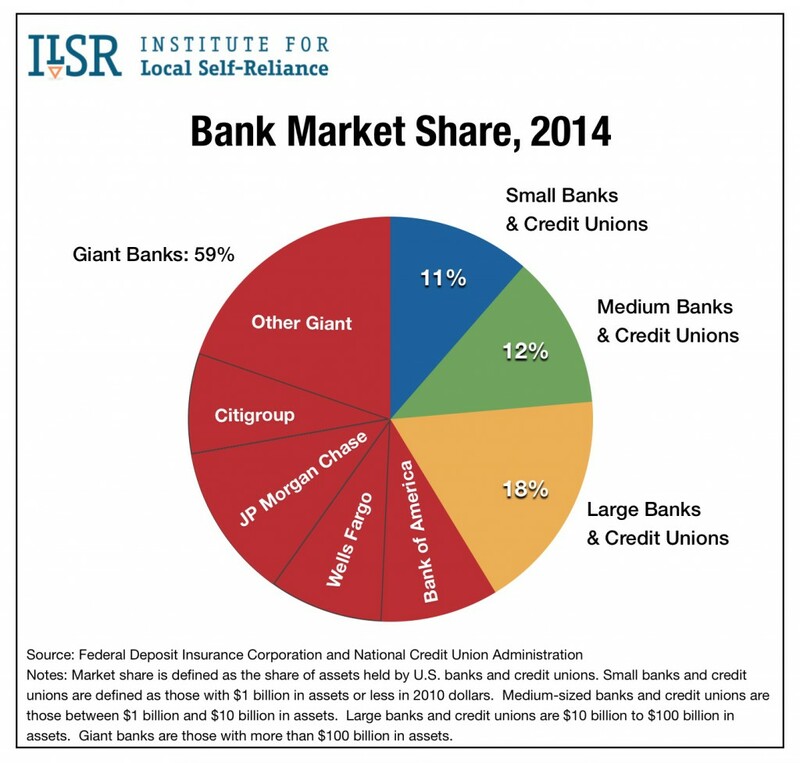 Meanwhile, the share of the market held by community banks and credit unions — local institutions with less than $1 billion in assets — plummeted from 27 percent to 11 percent. You can watch this transformation unfold in our 90-second video, which shows how four massive banks — Bank of America, JP Morgan Chase, Citigroup, and Wells Fargo — have come to dominate the sector, each growing larger than all of the nation’s community banks put together. “If we continue to go down this path, we’ll kill this concept of relationship banking,” contends Rebeca Romera Rainey, the third-generation CEO of Centinel Bank in Taos, New Mexico. Like other community banks, Centinel makes lending decisions based on its relationships with its customers and deep knowledge of the local market. It underwrites a wide range of business loans and home mortgages to local families. Many of these borrowers would likely not qualify for big-bank financing because they do not fit neatly into the standardized formulas megabanks use to evaluate their risk of default. Yet, despite having a portfolio filled with highly localized and unconventional loans — to a home builder, for example, who constructs super energy-efficient houses entirely out of old bottles and other recycled materials — Centinel has a remarkable track record when it comes to judging risk. In 2014, the bank had to write off as a loss just 0.05 percent of the total value of its outstanding loans. In contrast, the nation’s 21 megabucks collectively charged off 0.54 percent of their lending, or ten times as much. Even though they excel at doing exactly what we need our finance system to do, however, community banks like Centinel, which was founded by Romera Rainey’s grandfather in 1969 and is one of about 180 Latino-owned banks in the country, are disappearing rapidly. Exactly why is the subject of much debate. Surveys do indeed indicate that community banks are spending more on compliance as a result of Dodd-Frank, including hiring more staff, and the added burden is leading more of them to consider exiting the business by selling to a bigger bank. Yet, the correlation between Dodd-Frank and the drop in the number of community banks is not nearly as strong or clearcut as Lux and Greene suggest. Many of Dodd-Frank’s provisions took effect only in the last year and cannot explain losses in previous years. Consumer advocates worry that Lux and Greene’s paper, which prescribes policy changes that would make it harder for regulators to impose new rules on financial institutions of any size, may help fuel a campaign by the nation’s big banks to gut Dodd-Frank. Lobbying groups like the American Bankers Association (ABA) are already using the plight of community banks to push for overturning parts of the law, including many regulations that apply only to Wall Street. The real factors driving the decline of community banks are more complex and long-standing. In a lengthy paper, Arthur E. Wilmarth, a law professor at George Washington University, offers a comprehensive and nuanced discussion of the problem. Wilmarth provides a damning look at the regulatory disadvantages faced by community banks, but without feeding the deregulation agenda of their big competitors. Dodd-Frank is flawed, Wilmarth contends, but not merely because of the added burden some of its rules impose on community banks. Its chief failing is that it did nothing to end the too-big-to-fail status of megabanks, a regulatory structure that has long favored them, and the substantial public subsidies that go along with it. The decline of community banks actually began with a series of policy changes in the 1990s that untethered banks from their communities and allowed publicly insured commercial banks to engage in risky speculation. 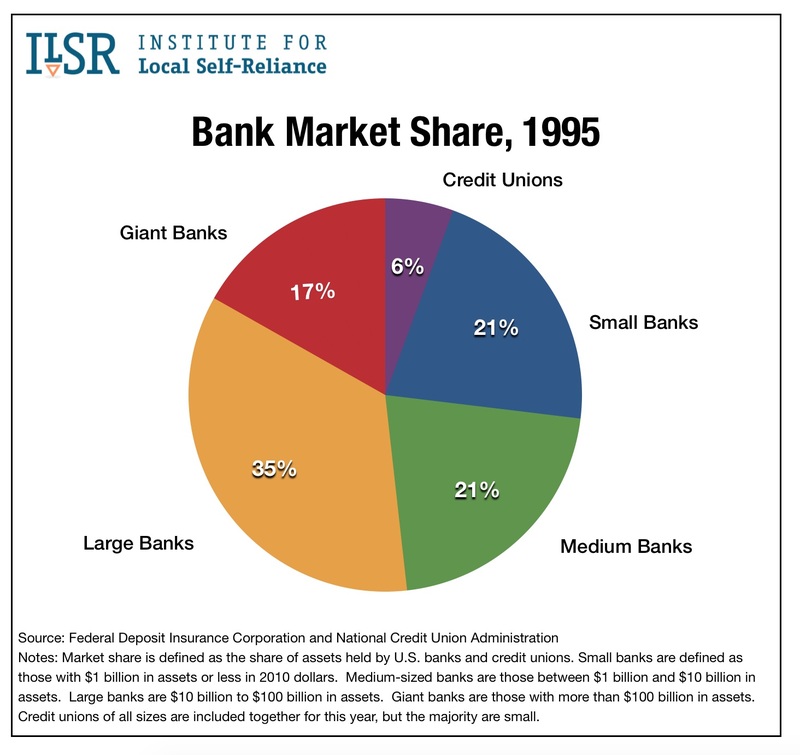 This shift in policy allowed big banks to become giant conglomerates, gobbling up market share and their smaller competitors. Wilmarth goes on to provide stunning examples of how, in the aftermath of the crisis, regulators put the squeeze on local banks, scrutinizing their loans and demanding even higher levels of capital than existing regulations called for, while explicitly exempting megabanks from the same requirements. Post-crisis reforms in many respects continue this regulatory favoritism for big banks. Although Dodd-Frank’s mortgage section includes many exemptions for small banks, the collective impact of the new rules is to further standardize mortgage lending. This works to the advantage of giant banks, which treat loans as commodities and use automated systems to evaluate borrowers, and it works against local banks, making it harder for them to do the kind of customized, relationship-based loans they excel at — and which their communities need. Some believe that the Federal Reserve’s policy of holding interest rates near zero since 2008 is the culprit. Small banks, in keeping with their focus on turning a community’s savings into loans, derive about 80 percent of their revenue from “net interest income,” which is basically the difference between the interest they pay on deposits and the interest they earn on loans. When interest rates are extremely low, it’s challenging to maintain enough of a margin to stay in the black, especially for startups. Big banks are far less sensitive to this, because they generate more income from fees — everything from checking account fees, which are higher at big banks than at small, to fees earned engineering complex securities. During earlier low-interest periods, however, new bank formation did not flatline to this degree. A more influential factor may be a 2009 FDIC policy change that increased the length of time, from three to seven years, during which new banks are required to hold significantly more capital and undergo more frequent examinations. The difficulty of raising this much capital — typically over $20 million — in a depressed economy, combined with a more arduous application process adopted by the FDIC in the wake of the crisis seems to have made starting a new bank virtually impossible. Should We Even Care About the Fate of Local Banks? Not everyone believes that blocking the emergence of new banks is a bad thing. Former Slate columnist Matthew Yglesias has argued that America has “far far far too many banks” and railed against the fact that we are “perversely committed to preserving them.” Yglesias contends that community banks are poorly managed, more risky, and less competitive compared to large banks. There’s nothing in the research record or our financial history to support his conclusions. In fact, local banks on the whole outperform their bigger competitors on several key measures of efficiency and profitability: they earn higher yields on their portfolios, have lower funding costs, and spend less on overhead. They’re also better at allocating society’s capital. Local banks make smarter lending and investment decisions. They channel more capital to job creation and community wealth-building, while incurring significantly less risk, than their giant competitors. 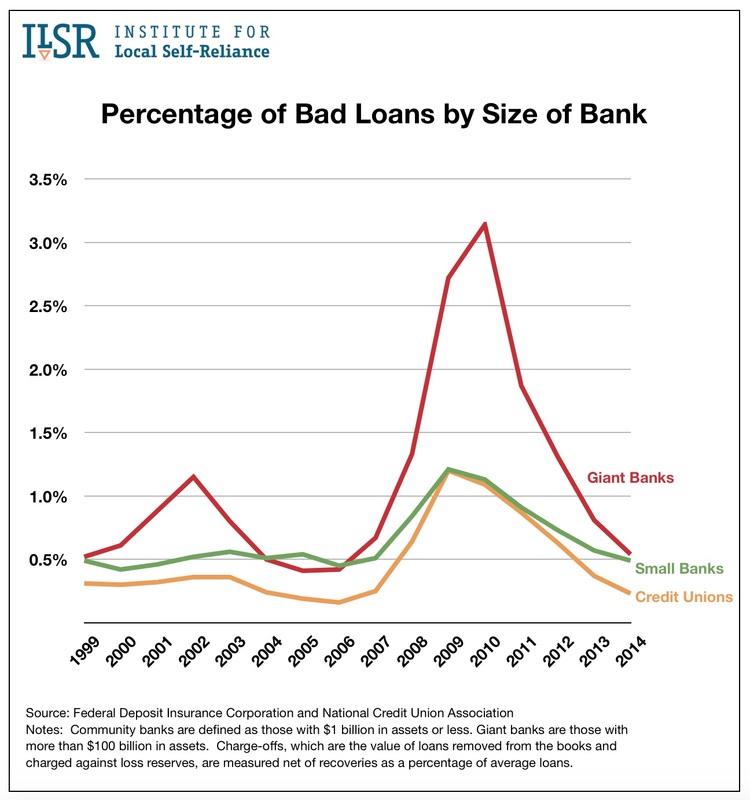 For the last fifteen years, compared to big banks, community banks and credit unions have had lower loss rates across nearly every category of individual and commercial loan. As our graph tracking overall charge-off rates shows, the difference has been especially pronounced during downturns, when defaults at megabanks tend to skyrocket. Mortgage lending is a good example. Between 2009 and 2012, the default rate on home loans across all banks was sixteen times higher than for residential mortgages held by community banks, according to Tanya Marsh, a banking law expert at Wake Forest University. This difference can have profound effects on families and neighborhoods. One study found that, with other factors held constant, counties in which community banks account for a higher than average share of the market have endured significantly fewer home foreclosures. But perhaps the most important reason to treat the decline of community banks as a national crisis is that, while megabanks devote much of their capacity to activities that enrich their own bottom line, very often at the expense of the broader economy, local banks are doing the real work of financing businesses and other productive investments that create jobs and improve our well-being. 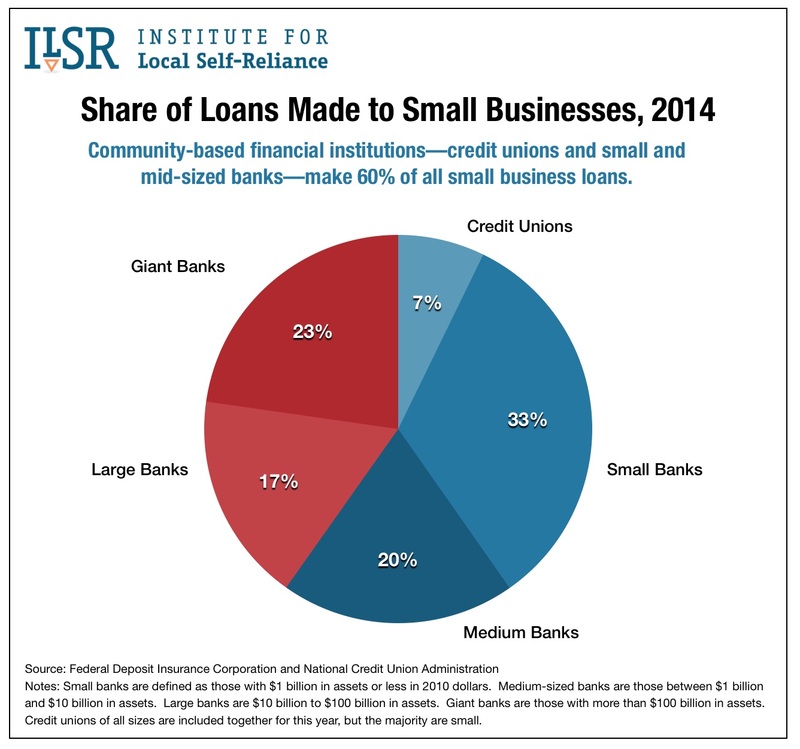 Of all of our graphs, the most remarkable and telling is this one showing the share of small business lending provided by banks of different sizes. While credit unions and small and mid-sized banks account for only 24 percent of all banking assets, they supply 60 percent of lending for small businesses. 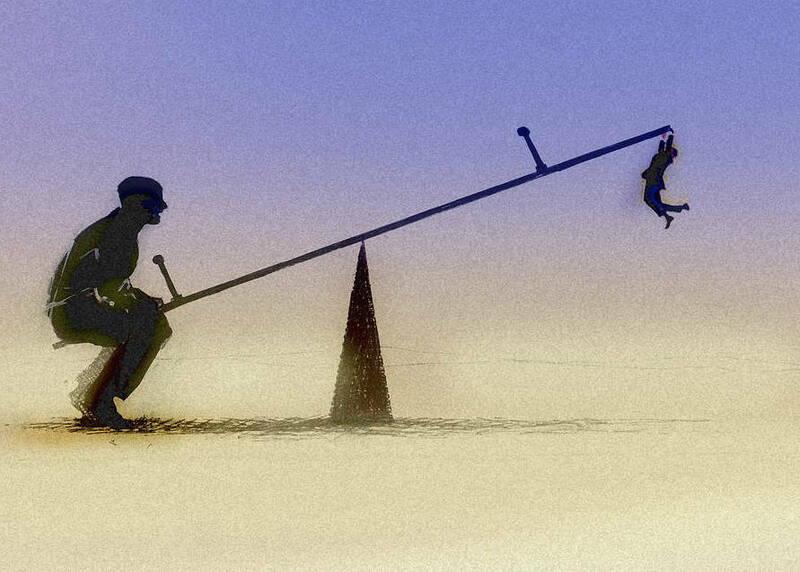 The inverse is true of megabanks: they control 59 percent of the industry’s asset, but provide only 23 percent of small business loans. Given how much ground these giant banks have gained over local banks in the last seven years, it’s not hard to understand why small business lending has continued to shrink even as the economy has recovered. Yglesias’s dream of a banking system comprised entirely of large regional and national institutions is fast becoming a reality in some regions. And the experience is not positive. In these places, financing for local businesses is significantly scarcer. And, according to a study published by the Federal Reserve, whenever a local bank fails, the surrounding community suffers: jobs growth slows, household income declines, and poverty increases. Local banks are not fading away in every state. They are numerous in North Dakota, where they hold over 70 percent of deposits. The state’s rural geography and robust economy partly explain the difference, but the main reason is the 96-year-old Bank of North Dakota (BND), the only state-owned bank in the nation. BND bolsters the capacity and competitive position of local banks by partnering with them on loans and providing wholesale banking services. The impact is significant. North Dakota not only has more banks per person than any other state, but the volume of business and farm lending they do is markedly higher (see our analysis), as is the share of mortgages held in state (which ensures that mortgage interest paid by residents benefits the state’s economy, not Wall Street). A few states and cities — including Colorado, Santa Fe, and Seattle — are now studying BND as a possible model for their own public banks, while Vermont and Oregon have taken initial steps in that direction. But, as critical and potentially transformative as these efforts are, it will take years for new public banks to grow to an influential size. In the meantime, we urgently need to fix the broader failures in federal banking policy. In early April, Thomas Hoenig, vice chairman of the FDIC, outlined a plan to do this by exempting from certain regulations banks that do not engage in securities trading, have limited involvement in derivatives, and hold capital equal to at least 10 percent of their outstanding loans and investments. Another, more significant, idea picking up momentum is that the best way to achieve a healthy banking system is not to add layers of complex technocratic regulations, but to adopt simple rules about the size and structure of banks. On April 15, Senator Warren gave a speech in support of this approach. Among other changes, she advocated for breaking up big banks and reinstating a long-standing policy, overturned in 1999, that barred banks that accept deposits from engaging in Wall Street speculation, thus ensuring that taxpayers are no longer insuring and subsidizing risky trading. This article was co-published with Yes! Magazine.